Summary: Baló's concentric sclerosis (BCS) is a rare demyelinating disease considered to be a variant of multiple sclerosis. Five BCS cases were diagnosed antemortem based on their typical concentric mass patterns on MR images and based on clinical and CSF findings. Histopathologic investigation was also performed in one case. Our case report supports the concept that BCS may be a self-limited disease that is not always fatal. Characteristic MR imaging findings may allow antemortem diagnosis of BCS when performed at the onset of the disease. Baló's concentric sclerosis (BCS) is a rare demyelinating disease considered to be a variant of multiple sclerosis. The initial terminology for this entity was leuko-encephalitis periaxialis concentrica, which is based on its early definition of “a disease in the course of which the white matter of the brain is destroyed in concentric layers in a manner that leaves the axis cylinders intact” (1). The clinical course of BCS was considered similar to that of Marburg's variant of multiple sclerosis, which has a monophasic rapidly progressive course with a fatal outcome (2). Of the <60 reported cases in the literature, most have involved young adults (age range, 4–56 years) (3–7) and have resulted in death within weeks to months (6, 8–10). Recently, however, an increasing number of cases have been described as having prolonged survival (4, 5, 7, 10–22) or spontaneous remission (16, 22). An asymptomatic case of BCS detected at necropsy has also been reported (23). The most commonly reported clinical manifestations are headache, aphasia, cognitive or behavioral dysfunction, and/or seizures. CSF studies often reveal a mononuclear inflammatory reaction and occasionally oligoclonal bands (2). The characteristic pathologic findings are alternating rings of myelin preservation or remyelination and myelin loss, consistent with demyelination, involving the cerebral hemispheres, cerebellum, brain stem, spinal cord, and optic chiasm (3, 6, 11). The typical MR imaging changes associated with BCS consist of concentric rings or a whorled appearance on T2-weighted and contrast-enhanced T1-weighted images. Several patients who were recently diagnosed as having this entity, based on a rather characteristic MR imaging appearance, were proved to have the typical pathologic changes of BCS at autopsy, suggesting that it might be possible to identify this entity during life (4, 9, 11, 12, 19). After these reports, cases of MR imaging-diagnosed BCS without histologic verification emerged (5, 7, 10, 11, 13–18). In this report, we extend the recent concept of the benign behavior of BCS, as observed in our five cases. Diagnosis was based on clinical signs and symptoms consistent with BCS, exclusion of other neurologic diseases, and the characteristic concentric rings on MR images. A 52-year-old man developed acute left hemiparesis, ataxia, and agitation in December 1996. MR imaging revealed a lesion with a concentric pattern involving the right centrum semiovale with contrast enhancement (Fig 1). A few T2-weighted hyperintense small lesions could be seen in the white matter. A stereotactic biopsy was performed and showed changes consistent with a glial tumor. The lesion was removed subtotally. However, after myelin staining, the histopathologic diagnosis was corrected as demyelinating disease (Fig 1C). MR imaging was performed 13 months later and showed postoperative changes on the T2-weighted images. Fluid-attenuated inversion recovery sequences revealed barely detectable small lesions with a concentric pattern (Fig 1D). The patient did not experience any relapse, and at the time of the last follow-up examination in June 1999, he had only residual mild left hemiparesis. 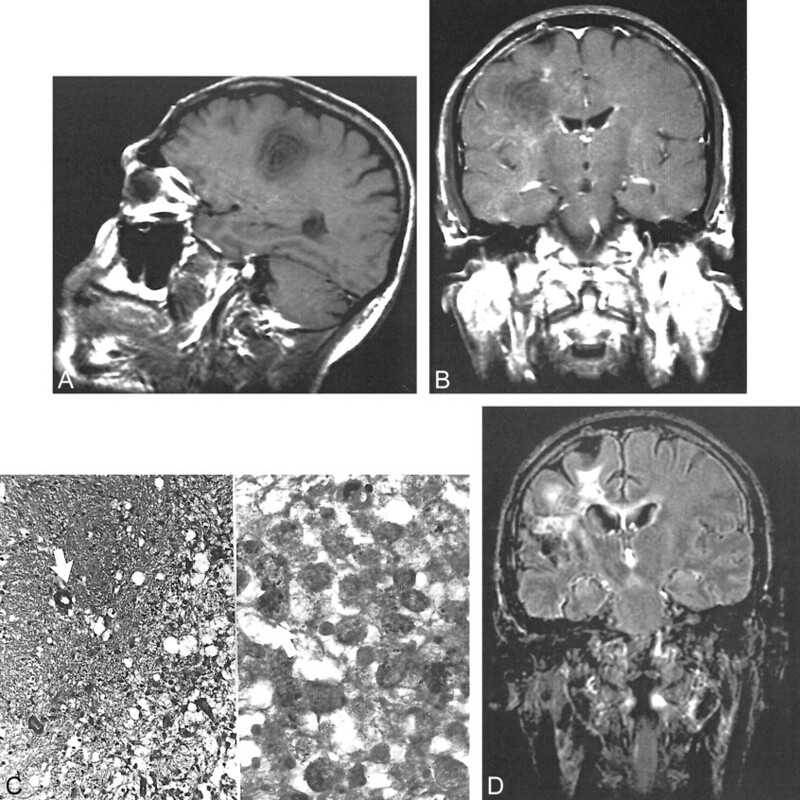 Images of a 52-year-old man who developed acute left hemiparesis, ataxia, and agitation (case 1). A, Sagittal view T1-weighted MR image (560/12/2 [TR/TE/excitations]) shows a lesion in a concentric ring pattern in the right centrum semiovale. B, Coronal view T1-weighted MR image with contrast enhancement shows focal, peripheral enhancement in the lesion. C, Histopathologic image shows the area that its myelin-spared (⇓) and strictly separated from the demyelinated area, which contains a high number of macrophages (hematoxylin and eosin, original magnification ×125). On the right (Sudan black, original magnification ×500), the demyelinated area and macrophages, including black myelin debris, can be seen (⇑). D, Coronal view fluid-attenuated inversion recovery image (15000/170/1; inversion time, 2500 ms) shows a residual concentric lesion 13 months after surgery. A 20-year-old woman was admitted in March 1997 because of acute left hemiparesis. Cranial MR imaging showed a mass lesion with concentric rings located adjacent to the right lateral ventricle and posterior part of the corpus callosum, without perifocal edema. Prominent enhancement in the periphery of the lesion was detected after contrast material was injected (Fig 2). The typical concentric pattern detected on the MR images was accepted to be consistent with a diagnosis of BCS, and corticosteroids were administered. The patient's condition improved, and the results of her neurologic examination became normal. During 6 months of follow-up, there were no further relapses. No further follow-up MR images of this patient are available. Images of a 20-year-old woman who was admitted because of acute left hemiparesis (case 2). A, Coronal view fluid-attenuated inversion recovery image (10000/102/1; inversion time, 1800 ms) shows the concentric lesion with two rings located in the right periventricular white matter adjacent to the corpus callosum. B, After injection of contrast material, enhancement at the outer ring of the concentric lesion is seen on T1-weighted MR image. A 48-year-old man developed acute sensorial aphasia 4 days before admission in January 1997. An upper respiratory tract infection had been treated with antibiotics during the preceding period of symptoms. A CSF examination disclosed an albumin level of 98 mg, positive oligoclonal bands, and a normal immunoglobulin G index. Visual evoked potentials and somatosensory evoked potentials were both normal. Cranial MR imaging showed a few concentric lesions located in the supratentorial white matter. There were also small multiple sclerosis-like hyperintense lesions detected on the T2-weighted images (Fig 3). The lesion localized in the left temporoparietal region showed ring-shaped enhancement after the injection of contrast material. Most of the white matter lesions also enhanced with contrast material. A diagnosis of demyelinating-inflammatory disease of the BCS type was reached according to the clinical, CSF, and MR imaging findings. This type of concentric pattern has not been described in association with any other demyelinating-inflammatory disease except BCS, and therefore, acute disseminated encephalomyelitis was excluded. The patient received high dose IV administered methylprednisolone (1000 mg/day for 7 days). After 1 month, the patient showed mild clinical improvement and no activity was detected by follow-up contrast-enhanced cranial MR imaging. There were no further relapses, and no neurologic deficit was detected at the final examination in November 2000. Final MR imaging, performed approximately 4 years after the first attack, showed that the concentric pattern had completely disappeared and that only small residual nonspecific, gliotic plaque-like lesion remained. No additional lesion was detected. Images of a 48-year-old man who developed acute sensorial aphasia 4 days before admission (case 3). A, Axial view T2-weighted MR image (5200/95/2) shows a concentric lesion and peripheral edema in the left temporoparietal white matter. B, Axial view unenhanced T1-weighted MR image (620/18/2) shows another lesion with concentric pattern in the left centrum semiovale. C, Coronal view fluid-attenuated inversion recovery image (15000/170/1; inversion time, 2600 ms) shows a concentric lesion in the left temporoparietal white matter and a multiple sclerosis-like lesion in the right hemisphere. D, Coronal view fluid-attenuated inversion recovery image (15000/170/1; inversion time, 2600 ms), obtained 1 month after treatment, shows impairment of the concentric pattern and edema of the lesion located in the left temporoparietal region. E, Coronal fluid-attenuated inversion recovery image (8000/110/2; inversion time, 2500 ms), obtained nearly 4 years after diagnosis, shows that the concentric pattern of the lesion has totally disappeared. Only small gliotic reminiscent lesions are seen. A 38-year-old man was hospitalized because of acute onset of dysarthria, dysphagia, and fatigue in February 1997. He reported an episode of dysarthria that had lasted a few days and had spontaneously improved 10 days previously. A neurologic examination revealed mild dysarthria and dysfunction of cranial nerves IX and X. A CSF examination revealed no oligoclonal bands, but the immunoglobulin G index was 0.717 (range, 0.3–0.6). Cranial MR imaging revealed multiple white matter lesions, one of which was located in the right centrum semiovale and had a concentric pattern with perifocal edema. This lesion showed prominent enhancement of an alternating ring pattern after the injection of contrast medium (Fig 4). Methylprednisolone (1000 mg/day) was IV administered for 10 days, and the patient's condition improved within a few days. Three weeks later, follow-up MR imaging showed the same concentric appearance without contrast enhancement. Nearly 4 years later, the results of the patient's neurologic examination remained normal. Because he had no further attacks, MR investigation was not performed. 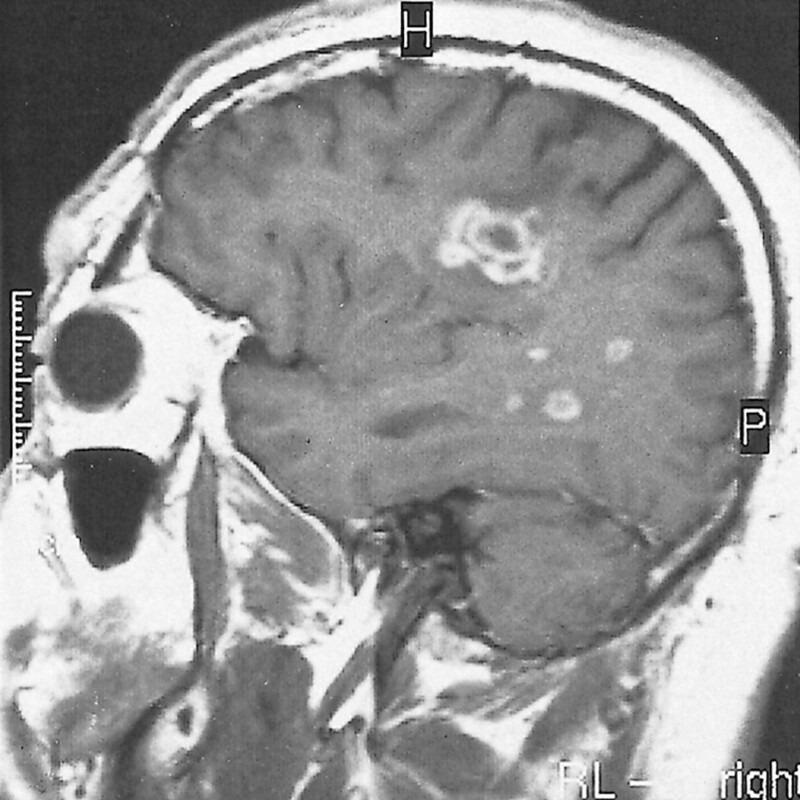 A 15-year-old female patient presented with acute left hemiparesis in February 1999. She developed hypoesthesia on her left side 20 days before admission that was followed by weakness 5 days later. She also had diplopia for 3 days that disappeared spontaneously. A neurologic examination revealed right abducens paresis, upper motor neuron type facial paralysis on the left, left hemiparesis, and hypoesthesia. Complete blood cell count, erythrocyte sedimentation rate, biochemistry, and the results of the serologic tests were normal, as were the results of a CSF examination (immunoglobulin G index, 0.386). Oligoclonal bands were negative. Visual evoked potential studies showed delayed latencies bilaterally, and somatosensory evoked potential studies showed delayed latency on the left. Brain stem auditory evoked potential was normal. Cranial MR imaging revealed a typical concentric lesion located in the right centrum semiovale (Fig 5A). A few hyperintense small lesions, one of which involved the brain stem, were detected on the T2-weighted images. On the multivoxel spectroscopic images of the concentric lesion (TE, 20), an increased choline peak and decreased N-acetyl aspartate peak were detected (Fig 5B). There was also a suspicion of mild prominent lipid and lactate peaks in 0.8 to 1.3 ppm. Methylprednisolone (1000 mg/day for 7 days) was IV administered, and the patient's condition responded well. At her final follow-up examination in July 1999, no further relapses were reported. 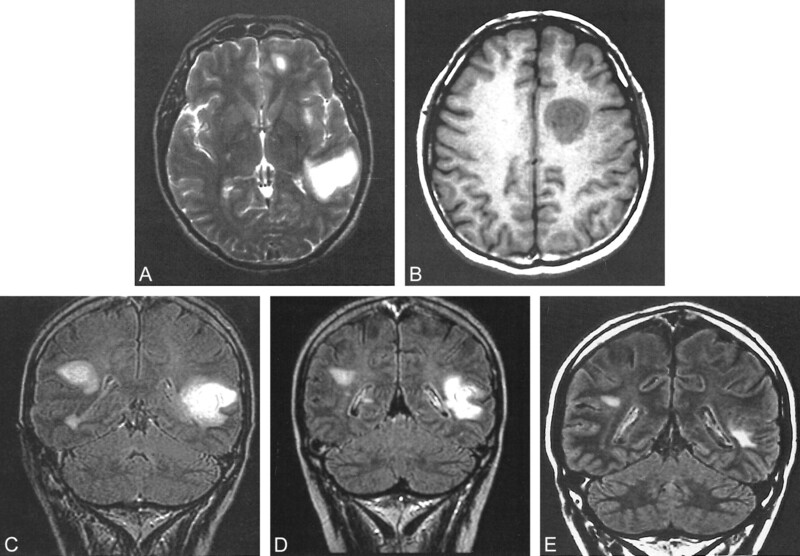 Images of a 15-year-old female patient who presented with acute left hemiparesis (case 5). A, Axial view unenhanced T1-weighted MR image (720/18/1) shows a concentric lesion with minimal hyperintensity at its outer ring due to magnetization transfer. B, Multivoxel spectroscopic image (1500/20/2) of the concentric lesion shows increased choline peak and decreased N-acetyl aspartate peak. C, Spectroscopic image of normal appearing white matter near the lesion shows all peaks as normal. The clinical, imaging, pathologic, and immunogenetic studies looking into the different forms of multiple sclerosis and various other idiopathic inflammatory CNS diseases that fall within the same clinical spectrum are relatively recent (2, 24). BCS is also considered within the spectrum of multiple sclerosis. It shares an apparent basic pathologic similarity to multiple sclerosis, with the exception of a lamellar pattern. The striking concentric pattern of demyelination that distinguishes this disorder has generated much speculation regarding its pathogenesis. It is hypothesized that the lesions begin at the central core, which is often a venule, and the primary demyelinating activity spreads from this focus. Although the initial triggering event is still unknown, a centrifugally spreading band of lymphocytes or factors emanates from this initial site. The polarity of the demyelinating bands suggests that the demyelinating activity is periodically reactivated and then fades in strength as it migrates from the center, only to be rejuvenated when the next bolus of activating substances arrives. Candidate modulators of immune activity include the many cytokines, some of which are known to undergo periodic fluctuations in levels (6). This hypothesis is highly speculative. It does not explain why the concentric pattern in demyelinating lesions is not more commonly seen in cases of multiple sclerosis. Recently, Chen et al (11) reported serial MR imaging results for five patients with BCS. Their data showed that the concentric lesions did not occur simultaneously but developed step by step in a centrifugal direction. These findings were in contrast to those previously reported by Sekijima et al (17). Based on these results, they proposed a possible pathogenetic mechanism for BCS that is similar to Moore's hypothesis (11, 13). 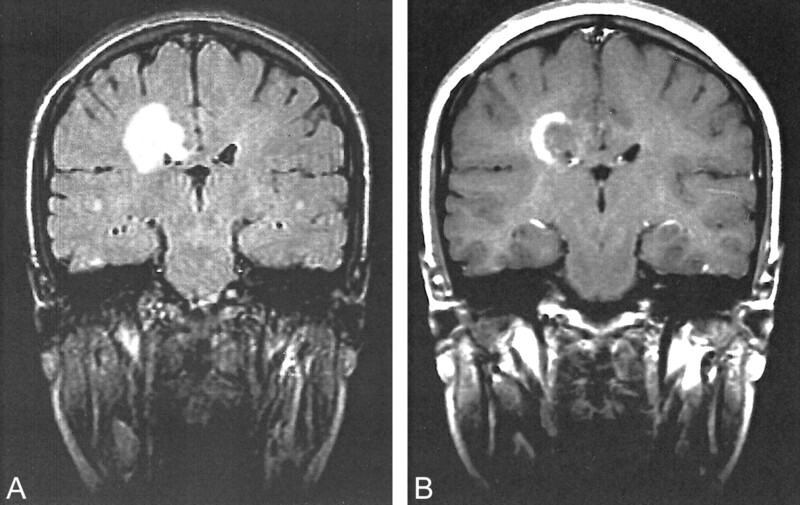 Patients usually present with symptoms of an acute/subacute onset that progresses over a period of weeks to months, suggesting a space-occupying lesion of the brain, similar to that in our first case. Because of the absence of antemortem diagnosis before the advent of MR imaging, the majority of patients reported had a monophasic course resulting in death within the first few weeks or months (2). Several patients who were recently diagnosed as having this entity, based on a rather characteristic MR appearance, have subsequently proved to have the typical pathologic changes of BCS at autopsy or biopsy, suggesting that it might be possible to identify the condition during life (4, 11, 14, 16, 25). Therefore, MR imaging should be considered the diagnostic procedure of choice in such cases. Clinical differential diagnosis includes acute disseminated encephalomyelitis, multiple sclerosis, neoplasms, and infections such as abscesses. However, the typical concentric pattern on MR images as described above, which is similar to other reports, is highly suggestive of BCS. The concentric pattern is not always observed if the MR imaging is not performed early in the course of the disease (25). A brain biopsy should then be considered to exclude other disorders. When histopathologic investigation is conducted, it is important to stain for myelin to determine alternating concentric zones of demyelination. We herein present five cases diagnosed as BCS based on their MR imaging findings, which were similar to those of other previously reported cases with antemortem diagnosis (9, 12, 13, 16). All our patients had a benign course without further relapses within a mean follow-up period of 30 months (range, 6–47 months) (Table). Such an outcome has also been reported in recent cases, with some showing spontaneous remission, as seen in our first case (16, 22). Most of the earlier cases with a progressive and fatal course were based on autopsy findings. Therefore, it is very likely that many cases with a benign course were either missed or misdiagnosed before the introduction of MR imaging into clinical practice. Furthermore, it can be speculated that BCS has also its own spectrum with different clinical-prognostic behavior. Because most of the reported cases of BCS occur in Chinese and Japanese patients and considering that known multiple sclerosis in these populations shows different clinical involvement pattern and course, this suggests that different defense patterns exist in different ethnic groups and explains clinical diversity. This case report further supports the concepts that BCS may be a self-limited disease that is not always fatal; MR imaging might show the pathognomonic features reminiscent of the histopathologic findings of BCS and allow antemortem diagnosis when performed at the onset of the disease; and, in addition to the typical concentric pattern on MR images, multiple white matter lesions consistent with demyelinating disease may also be detected. 1 This case report was presented at the 15th Congress of the European Committee for Treatment and Research in Multiple Sclerosis, Basel Switzerland, September 15–18, 1999. 2 Address reprint requests to Ercan Karaarslan, MD, Intermed Medical Center, Tesvikiye 143, Bayer Apt, Nisantasi, 80200, Istanbul, Turkey. Accepted after revision March 6, 2001.